Ian Westacott (b 1956) is a master printmaker using the same technique of copper plate etching as Dürer, Rembrandt, Goya and Degas. Westacott works from life directly onto the etching plate, building up the image back in the studio. “I'm obsessed with line,” he says, “it's the clarity and transparency of the etched line which makes drawing come alive for me”. What shines through in every beautifully crafted line is Westacott’s love of his chosen subjects and his technical proficiency. 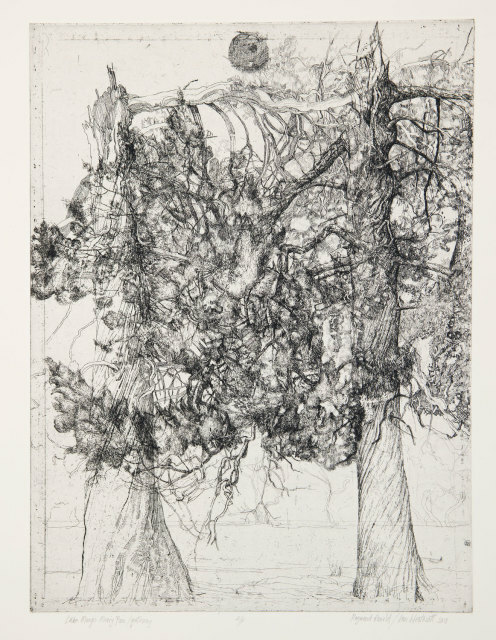 His images of trees are meticulously researched portraits of individuals. They are witnesses to history, a conduit between earth and sky, ancient guardians of stories, memories and ghosts. Ian Westacott was born in Australia and studied Fine Art at the Victorian College of the Arts. He has exhibited in the UK, France and Australia, including shows at the Australian Galleries and William Mora Gallery in Melbourne and The Royal Botanic Garden in Edinburgh.